So your company’s website has reached the top of Google’s search results page. Your phones are ringing, and it’s no surprise. As the occupant of one of the most coveted positions online, your small business is now more visible than ever! Time to kick back and enjoy the traffic, right? Many small business owners have learned the hard way that search engines can be unpredictable. A website that ranks well one month may be virtually impossible to find next month. 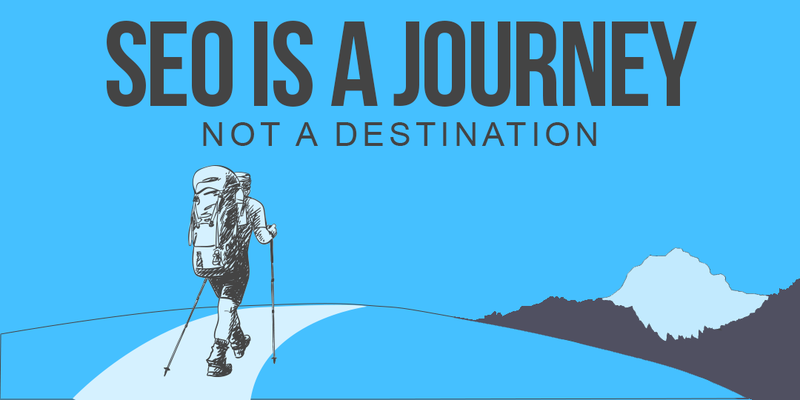 It’s important to remember that Search Engine Optimization is a journey, not a destination. Change happens all the time, and this is especially true in the case of Google. As a company on a mission to provide the best user experience for its own customers, Google is constantly updating and refining its algorithms to return the most relevant results possible when a user enters a search query. That means the technology that determines which pages rank in one of the coveted top spots is constantly evolving and getting smarter. As a result, search engine optimization (SEO) strategies must evolve too, and in some cases even try to predict future changes to stay ahead of the game. As many companies found out when Google’s algorithms shifted to prefer mobile-friendly websites a few years ago, websites with outdated optimization will eventually lose their top ranking and their competitive edge along with it. Once you reach the top of the search engine results pages (SERPS) how can you make sure you stay there? To maximize your company’s ability to retain its top position, continued maintenance of your web presence is needed. According to an article recently published in Small Business Trends, there are a handful of things that can be done to keep your website fresh in the eyes of Google. Not surprisingly, they coincide with some of their top ranking factors which were officially revealed earlier this year. Keep your website fresh with quality, updated content. This can come in the form of regular blog posts, landing pages, or even adding videos and images to your site to encourage your visitors to engage. Make sure your site is as fast as it can be. Earlier this year, BizIQ released an update to all new customer websites that greatly reduced load times, which led to improvement in rankings across a wide range of industries and geographic locations. No one likes to wait for a website to load. As it turns out, Google isn’t fond of waiting either. Keeping up a steady stream of high quality inbound and outbound links to your website is just as important after your website begins to rank well as it was before. But be wary of spam links. As with most things these days, betting on quality over quantity is usually safer. Don’t fall into the trap of believing that there is one right or wrong way to optimize your company’s web presence. By understanding that search engines are constantly evolving to reflect the habits of consumers and acting accordingly, your business will likely have an easier time achieving – and maintaining – that important top-of-the-page ranking.